ACT Well Services GmbH supplies well service, stimulation and cementing companies with full set of equipment or single units for efficient wellbore treatment. 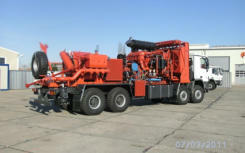 Reliable technology is mounted on special trucks, trailers ore skids and thus flexibly movable from wellbore to wellbore. ACT Well Services GmbH equipment is designed as a full mobile system outfitted in Diesdorf (Germany) according to the costumer needs. ACT- WS commands excellent know-how in the field of well stimulation and treamments. The rolling equipment “made in Germany” is constructed right down to the last detail according to the individual requirements of well stimulation companies and enjoys the confidence of oilfield operators. Mounted units are of highest standard, convince by functionality and absolute reliability even in conditions of severe cold and blistering heat. ACT-WS as an part of “American Completion Tools Inc.” is able to sell and Engineer all nessesery parts for a complete well installation. In an cooperation with OilChem GmbH we are able to supply stimulation and production chemicals.